Throughout the late 1960s and into the 70s, the Italian giallo movement transported viewers to the far corners of the globe, from swinging San Francisco to the Soviet-occupied Prague. 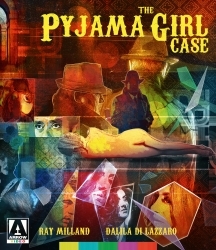 Only one, however, brought the genre's unique brand of bloody mayhem as far as Australia: director Flavio Mogherini (Delitto passionale)'s tragic and poetic The Pyjama Girl Case. The body of a young woman is found on the beach, shot in the head, burned to hide her identity and dressed in distinctive yellow pyjamas. With the Sydney police stumped, former Inspector Timpson (Ray Milland, Dial M for Murder) comes out of retirement to crack the case. Treading where the "real" detectives can't, Timpson doggedly pieces together the sad story of Dutch immigrant Glenda Blythe (Dalila Di Lazzaro, Phenomena) and the unhappy chain of events which led to her grisly demise. Inspired by the real-life case which baffled the Australian police and continues to spark controversy and unanswered questions to this day, The Pyjama Girl Case is a uniquely haunting latter-day giallo from the tail end of the genre's boom period, co-starring Michele Placido (director of Romanzo Criminale) and Howard Ross (The New York Ripper), and featuring a memorably melancholic score by veteran composer Riz Ortolani (Don't Torture a Duckling). Arrow Video's presentation is the best the film has ever looked, and with a nice allotment of extras, including Troy Howarth's entertaining and informative audio commentary, it's a worthy addition to any fan's collection.